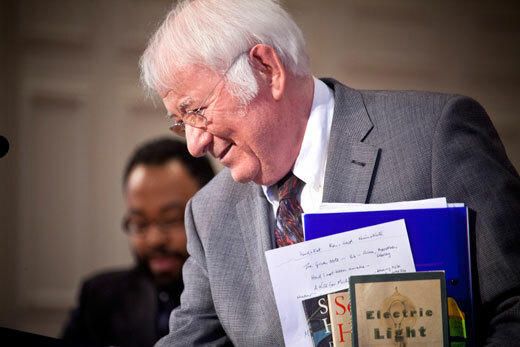 The world-renowned poet Seamus Heaney had a relationship with Emory that spanned three decades. Emory Photo/Video. When Irish poet and playwright Seamus Heaney decided to place his correspondence archive at Emory University in 2003, his papers catapulted the Irish collection at Emory's Manuscript, Archives, and Rare Book Library (MARBL) into one of the most renowned collections of Irish literature in North America. His personal and professional association with Emory has enriched the university and now Emory will celebrate the life and work of the late Nobel Prize-winning poet with "A Tribute to Seamus Heaney in Poetry and Song" on Thursday, Oct. 2, at 7:30 p.m. in Schwartz Center for the Performing Arts. Kevin Young, curator of literary collections and of the Raymond Danowski Poetry Library at MARBL, says Heaney began his association with Emory more than 30 years ago. Heaney gave his first reading at Emory in 1981, then conducted readings and poetry workshops at Emory throughout the 1980s and 1990s. "Heaney gave the first (Richard Ellmann Lectures in Modern Literature) in 1988," says Young, who studied with Heaney while at Harvard. "He was also in residence in my dorm when he lived there, so I got to know him over the years—as well as his poetry. He was one of the readers of my thesis, which became my first book. So he was a real influence on me personally, but also a terrific model for what a poet should be." Heaney agreed to participate in a Danowski Poetry Library Reading Series reading in 2013 because of his friendship with Young, just a few months before his death. "To serve as literary curator, responsible for his papers, has been wonderfully fulfilling. It's been a blessing to come full circle," Young says. The tribute event coincides with the exhibition "Seamus Heaney: The Music of What Happens," on view in the Schatten Gallery at Emory's Robert W. Woodruff Library until Nov. 25. The exhibition contains photographs, poetry drafts, rare editions and other materials from the Heaney papers held by MARBL. Geraldine Higgins, director of Emory's Irish Studies Program and curator of "The Music of What Happens," says the exhibit was planned to celebrate Heaney's extraordinary career long before his untimely death last year. "This wonderful line-up of poets reading on October 2nd is part of Heaney's legacy — to proclaim and profess poetry— with joy," Higgins says. The exhibition features materials from the Heaney collection held in Emory's MARBL including manuscript drafts, rare illustrated books, photographs and even the surface of his old desk where he wrote some of his celebrated poems. One of the highlights of the exhibition is a media room with recordings of his poetry read by Heaney himself and by other poets and artists including world-renowned Irish actor Liam Neeson and novelist Salman Rushdie, whose papers are also held by MARBL. "Ultimately, the hope is that visitors will come away from the exhibition with a renewed sense of how Heaney's poetry connects us to what matters in the everyday and the marvelous," Higgins says. "I hope too that they will be inspired to pick up a book of his poems and lose themselves in the music of what happens." The exhibition is free and open to the public through November 25. The program for "A Tribute to Seamus Heaney in Poetry and Song" will feature a number of poets—including Pulitzer Prize winners Trethewey and Smith—who will read Heaney's work and their own works inspired by him. Natasha Trethewey, two-term U.S. poet laureate, is the author of five books of poetry, including the Pulitzer-winning "Native Guard," and a book of poetry and essays, "Beyond Katrina: A Meditation on the Mississippi Gulf Coast." She is the director of Emory's Creative Writing Program and the Robert W. Woodruff Professor of English and Creative Writing. Kevin Young is author of eight books of poetry, most recently "Book of Hours," and editor of eight poetry collections. He is Atticus Haygood Professor of English and Creative Writing at Emory. Tracy K. Smith is the author of three books of poetry. Her most recent collection, "Life on Mars," won the 2012 Pulitzer Prize. William Corbett has written 15 books of poems, two memoirs, and multiple critical essays, and his connections with other poets and writers have become legendary. He directs the small press Pressed Wafer. Vona Groarke is an Irish poet with five published collections, including "Flight" and her most recent, "X." Nick Laird is an award-winning Irish writer of poetry and fiction, including "Go Giants" and "Glover's Mistake." Belinda McKeon, an Irish writer whose debut novel "Solace" has earned critical acclaim, is an award-winning playwright and journalist. Vega String Quartet will perform with special guests pianist Tim Whitehead and Atlanta-based soprano Wanda Yang Temko. They will perform two pieces, "A Kite for Aibhín" (voice/string quartet) and "Arrivals" (voice/piano/violin), each named for a Heaney poem of the same name. MARBL, Emory's Creative Writing Program and the Hightower Fund are sponsoring the event. Due to limited seating in the auditorium, tickets are required for the free event and are now available through the Schwartz Center box office from 10 a.m. to 6 p.m. Monday through Friday. A limited number of tickets also are available at four local independent bookstores: A Cappella Books, Charis Books & More, Eagle Eye Book Shop and Little Shop of Stories. Tickets are limited to two per person and must be picked up in person. Tickets also may be reserved online and by phone at 404-727-5050 with a $4 per order service fee. Tickets may be picked up the day of the event or earlier at will call. The Schwartz Center for the Performing Arts is located at 1700 N. Decatur Road, Atlanta, GA 30322. Parking is available in the Fishburne and Lowergate South decks.